Palm Lines - Palmistry Hand Reading! Lines found on the palm plays a very significance role for any palm reader, and the lines which are found on the palm really play an important role in persons life. And, it is really very important for any palmist to analyse and study each lines carefully, found on the palm of your hand. The clear and deep long lines on the palm indicates success, while the broken, thin and indistinct lines are a poor in life force of an individual. Each line on the palm relates to some kind of happening and indicates about life. The exact time of happening can also be ascertained by means of lines, for that a deep knowledge and experience is required. What are main lines on your palm? As per the concept of palmistry hand readings, it is necessary to get the correct knowledge about the lines found on the palm of your hand. Marriage line or Love line. Life Line is the line that extends from the edge of your palm goes above the thumb and goes ahead towards the wrist in an arc like shape. Learn more about a life line found on any palm here. Head Line deals with our beliefs, our philosophy, our attitude on and how we approach life. It represents mentality and intelligence.Head Line must be present on every palm. Learn more here. Everyone has a heart line, but different people have different types of heart lines. 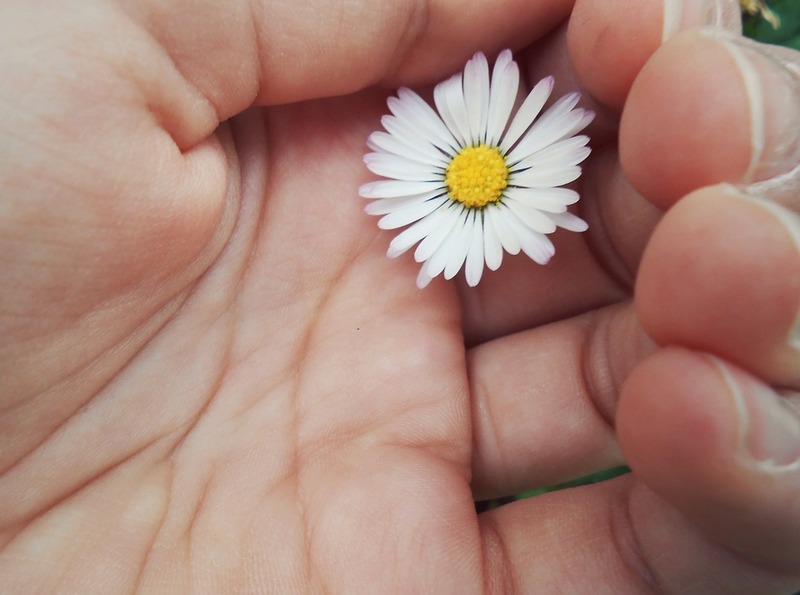 Each giving insight into a personal characteristics,relationship, and emotions. Representing love. Read here. Line of Apollo can rise from many places on the palm, it may rise from the Line of Life, the Line of Fate, the Plain of Mars, the Mount of Moon, the Line of Head, and from the Line of Heart, etc. learn more here. Fate Line starts from the base of the palm up towards the Saturn (middle) Finger, is known as the line of fate or the line of Destiny. Explore more about the characteristics of fate lines over here. Health Line represents the health along with the general being of a person. Health line relates to health but there is no fixed place of its source of origin. Learn about health line here. Marriage line can be indicated just below the base of the little finger. Several light lines in this area indicates love. The lines that are strong and clear in this area indicates marriages. Learn more here. The person having the ring of Jupiter is found to be quite sober and generous. But such persons are found to be highly ambitious.Learn something more about the ring of Jupiter over here. The one end lies between the finger of Saturn and index finger while the other end lies between the finger of Saturn and the finger of Apollo, is ring of Saturn. Learn here. The Ring of sun indicates the normal and average life. Hence the person having a Ring of the Sun leads a very ordinary life. He faces repeated failures in his life. Learn here. Ring of Venus has immense impact s on the individual. If this ring is wider enough then such a people is found to have spent all the deposited wealth of his ancestors. See here. If line of Mars on the palm, is away from the Line of Life the person is likely to be of an equable temper. It also indicates the state of marital relations. Learn more over here. This line can be seen critically, it can be known that there are different signs on this line from which the kind of travel can be happen, and observed. Learn more from here. The vertical lines may be above, below, or actually cross the marriage line, are believed to represent the number of children a woman may have. Explore more over here. Lines on Bracelet in palm reading is another most common practice, mostly a person will have two or three lines on bracelet. You may like to explore more over here. Those are the lines found on the palm of your hand, should be observed very carefully by a palmist, while analysing your hand. Not only these primary and secondary lines found on the palm are important, but also the condition of thumb, fingers, and nails are important. An expert palmist knows the importance of those lines on anyone's palm. To study and make a final report based on readings. Nails are important part of fingers on hands, and they say a lot of things about a person. Nail is considered as a good conductor of electricity and radiation. It is also said, rays from other planets enter in humans body through nails. While reading palm, one should not ignore nail colours, texture, marks, and signs found on nails, while examining. They are classified with respect to their shape, size, and texture. How to to Study Nails in Palmistry? Palmists tell the fortune through reading the lines, marks, patterns, but it is also required to remember about the nails, found on the fingers of a hand. Any person having short nails, is an indication of impulsive, aggressive and unsophisticated in-nature of that person. Infect, sometimes the person will be narrow minded weak and will have of wicked tendencies. As per palmistry studies, any person having such nails on their fingers, it indicates cheat, sinful and wicked nature. They could even deceit their own family members, thus they are not trustworthy and socially irresponsible. Many palmists believe, any person having short and rectangular types of nails, than it indicates a weak hearten. Sometimes, it also indicates a possibility of heart attacks. On any finger, if any person is having short and wide nails, than it is an indication of quarrelsome nature. They love to interfere in others' work and would have developed criticising behaviour. Any person having hard and narrow nails type, becomes moody and will do what ever they decide to do. They stick to their decision. They don’t care weather it is right or wrong. Under the palmistry study believing, any person having square nails type, it indicates weak, coward, timid, and subdued nature of that person. This type of nail is wider at upper end and narrower at lower end. Any person having such nail, it indicates laziness and loneliness. The person remains apart from society. Any person having such nails, It indicates, short tempered. The person is perfectionist and they complete the work once they take it up in hand. They don’t want any interfere form others in their work. Any person having short nails and knotty fingers, it indicates a quarrelsome nature. If, it is in the fingers of a female - then she will definitely overpower her husband. As palmists believe. Any person having such nails, it indicates the person is firm minded and quick decision-makers, they also know how to act on their decisions. These person are quick adoptable in the quick changing situations. If a person is having such nails, it indicates weak body and fickle minded. These people can’t take their own decision and they mostly depend and act on advice given by others. Palmists also believe, if any person having long and curved nails, it indicates a bad character and illegal affairs. As a result these people are not so respected in society. Such nails are a little longer than its wideness with natural glow. Any person having such nails, it indicates a motivated, sensible, and desire to always move forward in live. These people are highly successful in life. Palmistry is an art of analysing hand and telling the fortunes through reading the lines, marks, patterns, signs, and other spots found on the palm of a hand. While observing a hand, it is essential for a palmist to analyse not only the lines, marks, and signs carefully, but also the nails - before making any report. About Palm of your Hand! The Palm of your hand, is the central region of the front of the hand. 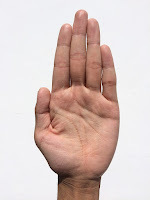 As per various dictionaries, the part of the inner surface of the hand, that extends from the wrist to the bases of the fingers - is known as palm. The palm, which is the central region of the anterior part of the hand, located superficially to the metacarpus.The four fingers can be folded over the palm which allows the grasping of objects. In palmistry the formation of palm has a special importance, because hand prediction to learn a person's personalities, fortune and future depends on the palm lines, including fingers, and thumb. Palm of your Hand in Palmistry! Palmistry is the art of analysing the physical features of the palm of your hands to interpret personality characteristics and predict future happenings. It is really very important for a palmist, to observe not only shape and size of the palm, but also the colour, texture, lines and signs - found on them. Under palmistry concepts, before going deep into reading hands, it is considered much important to observe the palm of the hand carefully. As per the theory of palm reading, reddish colour palm is not an indication of excellence. As, it shows aggression, that could make a person very short-tempered, as-well-as suspicious by nature. Palmists also believe, as a result such people get angry easily. These people struggle bad, and hardly get successful life, just because of there narrow-minded attitude. In palmistry hand reading, pinkish colour of palm is considered healthy, which shows vitality, and makes an individual very kind in-heart - with very high morals and ideals. Such person are believed to get success in society and in their life very easily, just because of there own hard efforts - no-matter from wherever they've started. These are the real people out there in the world, who make real contributions to the development of the society and nation. As per believers of palmistry, yellowish colour palm is not considered as a good one. It is believed to be an indication of sickness, and results in making a person go-towards introversion. As per palmists, it is also believed, they get success hardly an remain unstable just because of their irritable nature. Sometime, these people also become narrow, weak-minded, and noncontributory for the society. Dry skin palm is another indication of sickness and unsuitability in nature as per the concepts of the palmistry. These kind of people get hard to take any decision by their own! They work according to the ideas of others, as a result face failures. They are considered as sick, or sometimes mentally unfit. This kind of palm is said to be the best kind of palm in palmistry. It shows sensitivity, that makes a person very soft hearten, and sympathetic towards other. In real sense, they contributes to the society, as they work according to there own clear vision, which makes them successful in their life, easily. In palmistry, big hands is considered as a fortunate hand, which makes an individual a very sharp-minded and cleaver in nature. While, very small hand is an indication of short-tempered, and narrow minded, that makes them get very hard to success. At, the end please remember, according to the study of palmistry - it is important to observe the hand and palm with a clean vision. Fingers in Palmistry - Hand Readings! We know, the fingers are the body's limbs and a finger, is the manipulation and sensory organs in the hands of humans and other primates. Usually, there are four fingers and one thumb in every individuals' hand. Four fingers and a thumb form the freely movable part of the hand. All has three separate bones - except the thumb, only two. And, for a palmist it’s really very important to study the size and shape of all the fingers carefully. So, to get closer to any persons' life by reviewing the fingers on hand carefully. What does your fingers mean in palmistry? 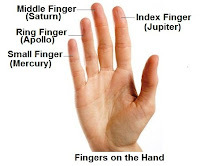 As per the concepts of palm reading, the very next finger to the thumb is called index finger (or the finger of Jupiter), which shows the power of leadership quality, only if the index finger is as long as the size of middle finger (or finger of Saturn) on hand. It is highly believed that, the Jupiter's energies associated with the index finger, that indicates will-power, authority, leadership, confidence, pride, and ambition in one's life. The longest finger on your hand is middle finger. also called the finger of Saturn. A very long or a very short middle finger tends to indicate a serious imbalance between the psychological and the physical state of a person. It is believed that, if the Index finger and the middle fingers are equal in length, in that case a person commits suicide or dies through an unnatural cause. 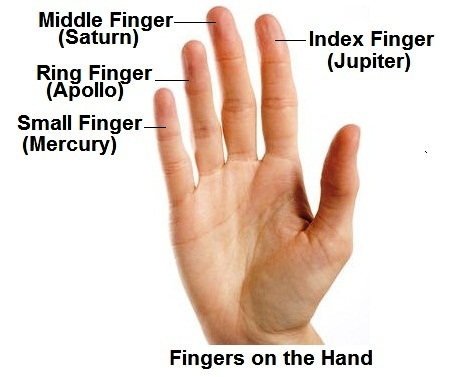 The finger next to the finger of Saturn is called the finger of Apollo (or the Sun), well-know as the ring finger. Generally, this finger is almost equal to the index finger in length. But, if it is very long, than it is considered as an emotional instability, introspection and a disturbance of psyche. If it is leaning towards the finger of Saturn than it is considered as excellent. While, if it is leaning towards the finger of Mercury, it indicates that an individual’s family life cannot remain happy. The smallest finger on your hand. that's end reaches the tip of the finger of Apollo, or up-to the upper joint of Apollo, and if it is long, than it shows self expression, and intuition. People with this kind of small finger loves to explore new knowledge & skills and make best in study and teaching. It is believed that, they would assuredly get very fortunate and reach a very high position with their own efforts and will power in their life and society. It is also believed by the renowned palmists that, if the finger of Mercury is very short, than it is not considered good as it give feeling of inferiority. For a palm reader fingers are equally important to thumb, including the lines, marks, and patterns - found on palm of your hand. Thumb in Palmistry - Hand Readings! We already know, the short, thick finger on the side of our hand, that sets lower and apart from the other four fingers, is our thumb. Thumb is considered as the most important part of our hand, and it’s really very difficult to think of doing anything without the need of using thumb. Our thumb makes it possible for us to hold and pick things up, and work easily. Thumb in a way represents the whole hand, and importance of fingers without thumb becomes zero. The thumb has direct connection with the mind, which is also in a position to indicate power, energy, and personality of a human. Since, we know thumb in a way to represent the whole hand. Hence, more importance is attached to the thumb in palmistry - hand readings, than to the lines, marks, and patterns on the palm. In the theory of palmistry, thumb is believed to show individuals' relation with love, logic and will power. It possesses a unique and wide range of motion, opposite to the hand's other fingers. If it is short, it makes individual emotionally unsettled. If it is long, it shows ability and energy to do things in life. If thumb is thick, it makes an individual forceful, and softness makes artist. The first part of thumb is considered to indicate will-power in palmistry. A person whose upper part of the thumb is longer than the middle part has strong will power and these people are independent in taking decisions. They don't like subordination of others. These people, whose upper part of the thumb is longer, than other parts, have deep faith in religious thoughts. Their own individuality becomes so attractive and strong that anyone can get influenced by them. It is also believed, they easily get name, fame, and respect in their society. They neither cheat anyone nor get cheated by anyone. They make many friends in their life, and also get respected position in their society, when in older age. Middle part of the thumb is believed to be the place for power-of-logic. If this part is longer than upper part, it makes an individual full of logic and speciality, they won't let anyone stand in front of their logic and reasoning skills. These people don't get as much respect in their society - as they always try to get just and unjust things accepted by reasoning. Sometime, when they fail, lacking in logic, they try to prove themselves by making crying and hue. If the upper and middle parts of thumb is equal in length, shape and size in anyone's hand, than those people are said to be the best. Because of their thumb as per palmistry. They get excellent ability of will power and logic, making them very special in society. They always take decision with care and do anything which is acceptable. They can be a cultured businessman or at a responsible position in government organisation, or even they could be an artist. 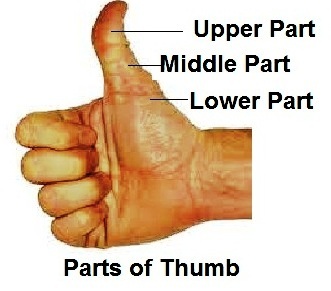 The third position of thumb is lower part, that is exactly the place of Venus. Which is considered, has a part that represents love and relationship among family and friends. The lower part depends on the Mount of Venus. A prominent, smooth, elegant and pink colour of this region is considered beneficial under palmistry hand reading theories. If this part is prominent, smooth, elegant and pink, than it shows love matters, affection and relationship bonding, if this part is developed in balanced way, than everything works smoothly. In palmistry an individual’s thumb plays a very special role. And for a palmist it’s really very important to observe the thumbs carefully, as the thumb reflects the whole individuality of a person. This is what believed about our thumb, in the art of hand reading - palmistry, from the beginning! Palmistry - Hands Reading Basics! 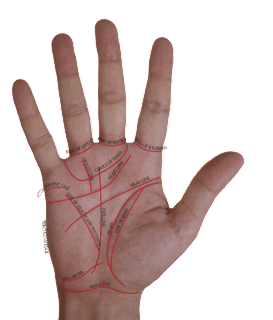 Palmistry is an ancient art of telling health, wealth, love, and luck through the shapes, sizes, and presence of lines, marks and patterns on the palm of your hand. Each hand tells its own story and for a palmist (who reads your hand) its really not tough to look in to an individuals past or future just by reading those lines, marks and patterns on the palm. This ancient art and science of hand reading has had been getting developed by many people around the world. Initially. got developed in ancient India. But, in today's demanding technological era people are still interested and giving trust to the practice of hand reading for healing and fortune in poor life. We need to plan our future, and for this those who believe - go to Fortune Tellers like Palm Readers, Astrologers, Numerologists, Tarot Card Readers, Psyches, and etc. Not only in modern days we believe them, but also in olden & golden days - many great people use to go to such specialists to get guidance, heal their lives, and find ways to fortune! What do our hand lines mean? In the art of palm reading or hand prediction, to learn a person's personalities, fortune and future by analysing their hands, also called Chiromancy. Our hand lines mean a lot as per the palmists' theory. Those who read our hand, say it is very clear for them to get the details about or past, present, as-well-as future only by reading the palm lines, marks and patterns on hands. It is notable that, in palmistry reading, not only palms matter - but also every finger, thumb, and nails are equally important. For predicting health, wealth, and fortune, etc. How do a palmist read your palm? The palmist read your palm, by choosing your hand, they read your primary lines, secondary lines, mounts on planets, and other significant lines, marks and patterns on the palm. It is believed that, lines belong to a Planet and the benefit or loss an individual can get through them, depends on the lines, marks and patterns the individual mounts - found on the palm of your hand. In the art of palmistry reading, our palm lines, marks and patterns, their condition, and presence on different planets' mount plays a very crucial and especial role. So, this is very important for a palmist to consider both hands in defining any individuals' life - for wealth, health, happiness, love, and luck, etc. Which hand should be considered for palm reading? There is the theory of an active hand and a passive hand. Our active hand is our dominant hand, whereas the passive hand is the non-dominant hand. There is a theory that says, the left hand shows potential, while the right hand shows what we've done with that potential. Although, some palm readers believe that “the left is what the gods give us, the right is what we do with it”. It is also believed that, for females, the right hand is what they're born with, and left is what they've accumulated throughout their lives. But for males, it is the other way around. Can our palm lines ever change? According to the art of traditional palm reading theory and methods, the lines on our hands can change, significantly. Its not our future that changes palm lines, bur its the actual events after or as they appear. It is theoretically beloved that, our dominant hand records all those events in our life - and because of that the hand where we would most likely see those changes. Not only lines, but also the marks and patterns on the palm of our hands, keeps changing, appearing, disappearing, and again appearing! In astrology time and date of birth is required to get knowledge about an individuals' life, and to decide which horoscope sign they belongs to. But in palmistry - hands are considered, and the whole prediction involves around the lines, marks and patterns found on the palm - matters! Types of Hand in Palmistry: Earth, Water, Fire, Air, Mixed Hands! Welcome to PalmFate.com, a premier place on the Internet to find all the interesting information you need to know about the Ancient Art of Palmistry - Hand Reading, Astrology, Horoscope Signs, and lots more related to them! Just aim to make you easily learn and understand, so that you can get most out of your life. ©2010 - 2018. All other Brand Names, Logos & Information presented here, are properties of their respective owners.